Welcome to eRevMax Customer Support! The Customer Support team is your single point of contact for all your support related inquiries. The team responds to all inbound inquiries to provide resolution for all technical and functional issues. eRevMax offers multi-lingual support 24/7, 365 days a year to ensure adequate support to our global customer-base. We believe in the 'follow-the-sun' approach which helps us deliver effective and efficient customer support during our customer’s business day. 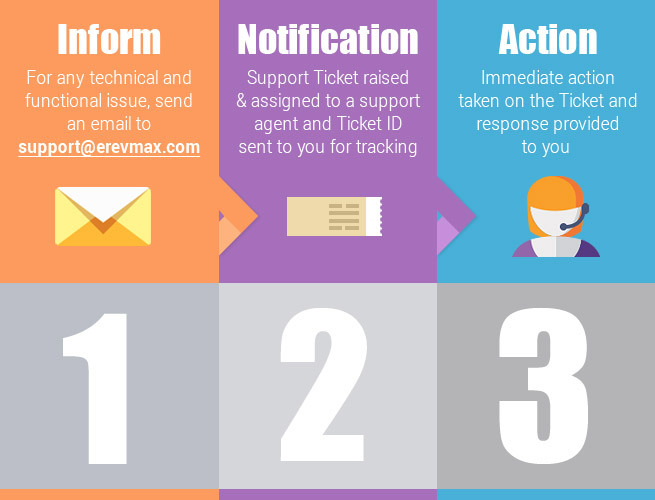 Our support process is very simple - to resolve any functional or technical issues, email the eRevMax Customer Support team at support@erevmax.com, A support ticket will automatically get created and assigned to an eRevMax Support Agent who takes immediate action to resolve your issue and respond to you. The Customer Success Management team assists customers with product implementation and training. Each client is assigned a Customer Success Manager who is available during customer business hours. The Customer Success Manager provides assistance and guidance during the setup and configuration of the product, product training and information on new products and services. As the name suggests, this team’s mission is to help you get the maximum return on investment (ROI) from your eRevMax products & services thereby aiding in your businesses e-Distribution success. The main goal of the team is to create a win-win relationship with all customers while providing measurable business benefits leveraging eRevMax products and services. The Strategic Account Management team aims to provide hotel customers, channel partners and 3rd party system providers like PMS / CRS partners with unparalleled service experience from a commercial perspective thus managing customer expectations in a fast paced, global environment. The Strategic Account Managers own the financial health and growth of the account. They are the key contact points at the Corporate / HQ level and work together with the clients to develop online distribution strategies to help maximize revenues. The Service Management team is a single point of operational contact for group customers and key accounts. The Service Managers are available during your local business hours providing multi-lingual service to ensure your team is well versed with your eRevMax products and utilizing them effectively. Your Service Manager will lead the support process and insure all channel and partner connections are working and providing the data you need to develop a successful business with electronic sales. The team manages customer expectations in a fast paced, global environment and provides ongoing service delivery from a commercial perspective. At eRevMax, we value the relationships we build with our customers, partners and the wider industry. Our Support teams are committed to addressing all your requests promptly and always providing you with the best service. We ensure that your concerns are dealt with in a timely manner and you are put directly in touch with professional, qualified support agents who understand our products and services thoroughly. We strive to continually provide you with the best service. If you have any comments or questions, suggestions for improvements or experiences you would like to share, please write to us at support@erevmax.com. While bringing tailor-made features for you, we constantly endeavor to improve the product experience helping you to further 'Save Time Make Money'. We look forward to serving you.